Venue: Trupp Cooking School. 1/53 Barry Street. South Yarra. The Friday evening talk is designed to give you an introduction to Ayurveda and how to integrate it into a busy contemporary lifestyle. The Sunday cooking day is a celebration of food and will teach you how to use fresh produce and spices to bring balance and wellbeing. You will see that Ayurvedic cooking is not just Indian cooking but contains principles we can apply to all our cooking AND eating experiences. I will demonstrate how to use herbs and spices to enhance the flavour and health benefits of the ingredients, and most importantly, the digestibility of each dish. Together, we will prepare ghee and dhals, applying the Ayurvedic principles in action, on the stove and at the table. You will learn my famous ‘One and Only Dish’ technique, and receive printed handouts of all the principles and recipes. This course is suitable for anybody. You will gain many useful cooking tips in addition to the recipes, and practical enlightening guidance on eating and living well. First Melbourne Seminar Special: reduced from $320 to $290. Limited to intimate number of 10 participants. These teachings have transformed the way I cook. The principles allow me the confidence to improvise with flavours and ingredients resulting in a greater variety of food with less effort. I am eating more of what I need and want and feel better for it. I look very much forward to the next series of videos. Petra Masopust Sachova. Mother. Prague. I highly recommend a cooking session with Tim. 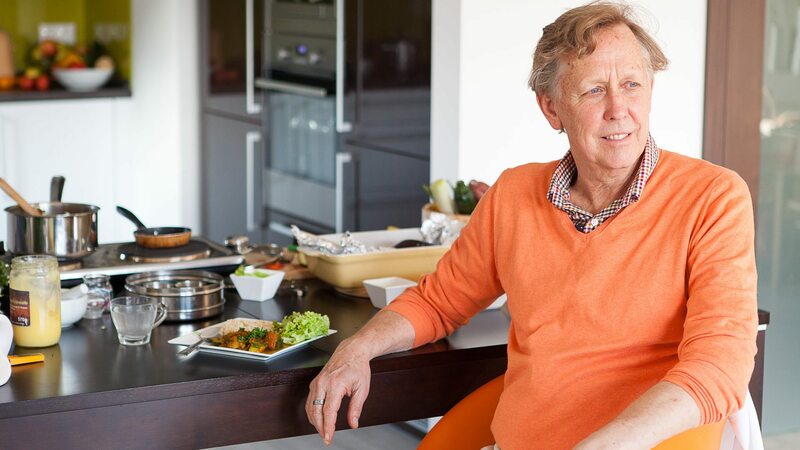 Tim has the ability to present ayurvedic concepts directly in an easy to understand way and encourages us to become involved and enjoy the cooking and preparation process. We also get to taste and enjoy the results. Tim’s cooking is literally a feast for the senses! For a truly entertaining, informative and inspiring Ayurveda cooking session Tim’s sessions are ideal for both those new to Ayurveda and those who are more familiar with the Ayurvedic approach to balancing our individual constitution with our food and cooking methods. Patricia W. Sydney. Yoga Therapist. I never imagined that Ayurvedic cooking was so easy, quick and scrumptious… its ancestral logic served on a fork. It suddenly all made sense, ‘serve the fire’ in the belly (agni) and ‘all will be well’. Thanks Tim for making it all make the knowledge accessible (and the ghee is yummy). Anna Cominos. Writer. Kythera, Greece. Sydney. Ayurvedic cooking by Tim Mitchell is a creative joy for the chef and the diner. What you may not have taught by wise grandmothers you have the opportunity to acquire in a comprehensive form as a set of simple principles that will forever change your culinary art and eating habits. The meals by Tim are visually and tastefully balanced so that you do not need to satisfy their additional tastes. Recipes are not only simple, fast and healthy but mainly delicious. Simply put, foods cooked according to his technique will “do well” to you. Kamila Sušanková Manager, consultant, housekeeper and happy mum. Prague. Czech Republic. Spending two and a half days with Tim in the kitchen was a pleasure from beginning to end. I gained an insight into how Ayurvedic herbs are used in various foods that resulted in delicious and satisfying culinary indulgences throughout the weekend. Spicing up the atmosphere were entertaining stories about herbs and Ayurvedic traditions that were interspersed in the flow of each day. The group in attendance hovered over the pots and pans in the kitchen so as not to miss any important details of the cooking process that could allude them later contributed to the warm atmosphere. Sitting at the table and eating unsurprisingly produced an even more jovial atmosphere. An inspiring and relaxing weekend that I hope to repeat.